Strudel is a magical dough. Some flour, a little bit of water, a touch of butter kneaded together into an unassuming dough. You would never know that this little lump of dough would be able to amount to so much, and then you stretch it. You pull the dough to, what you believe, is the limit only to realize this magic dough needs wants to be stretched even further. The dough starts off just like any dough, a dense ball. Slowly the ball is rolled and stretched and stretched some more until it starts to get really thin. At this point you might think you can’t stretch it anymore, but you can and will. The dough is continuously stretched and pulled until you can see through it. When the dough starts to slightly tear a little bit, you’re almost there. 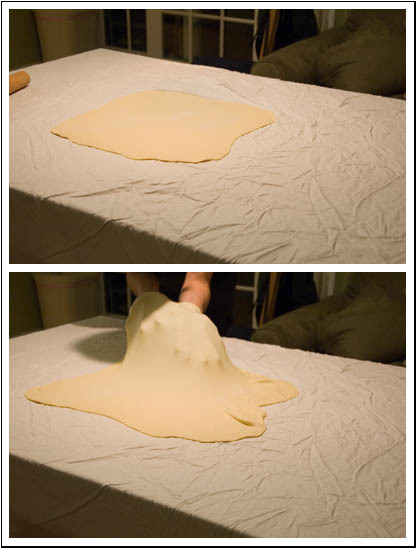 This dough was stretched to about four feet by six feet and was paper thin. When it was the size of my table, I trimmed the edges, filled it was a wonderful apple filling, and baked it off like anything else. While the end dessert was good, pulling the dough was definitely the highlight of this dessert. I’ve always been intimidated by pastry dough, but I’ve never had trouble eating a pastry, especially one that’s apple filled ;). It looks delicious and flakey. That is one imcredible dough! Love strudel. re: macarons – humidity is indeed your biggest challenge…that’s why I bought a thermometer with a hygroscope so I’d understand what exactly is going on in the environment. Wow, I’m impressed! How do they look post baking? 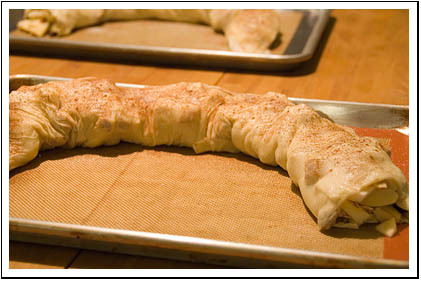 Mmmmm….apple strudel! I’ll have a piece :o)Great post Jef!